2 What is this job? 3 What are the pros of this job? 4 What are the cons? 5 Who’s especially suited to it? Executive Search firms aim to fill senior roles within other organisations, most often large companies or professional services firms. We think executive search (a.k.a. headhunting) could be a good option for those who want to earn to give, desire work-life balance, and whose main strengths are verbal and social skills. Nonetheless, we don’t recommend executive search to many people because the career capital and exit options are weaker than nearby alternatives. • High pay relative to how competitive it is, making it a promising option for earning to give, especially if you're not good with numbers. • Opportunity to build a strong personal network. • The skills developed are more narrow, and the field is less prestigious than other professional services. As a result, exit opportunities are weaker than alternatives like consulting or marketing. • The social impact is likely to be small unless you recruit for firms that are themselves high impact. Social and verbal skills, professionalism and similarity to clients, extroversion. After completing a degree with almost any major, you can apply for researcher roles at the largest firms, such as Korn Ferry International, Spencer Stuart and Heidrick & Struggles. For technology firms, the leaders are The Up Group and Renovata Partners; for financial services, Blackwood is the largest; for legal firms, options include Piper Pritchard, Hedley May, Fox Rodney, Major Lindsey and Africa. UK-only firms include Sax Bam and MBS Group. A more comprehensive list of firms in the sector is available here. You can apply for associate or higher roles if you have previous recruitment, sales or marketing experience, or an MBA. You can also jump to a higher level later in your career taking advantage of knowledge of an industry you have worked in. This is apparently a move some people make for better work-life balance. For this profile we interviewed three people working in the executive search industry, read the online sources cited below and gave the resulting profile to a further two people in the industry to edit. Executive Search firms aim to fill senior roles within other organisations, most often large companies or professional services firms. It is among the best paid work in ‘recruitment’ and ‘human resources’. Build a database of outstanding people in the relevant industry who could be placed in other roles. Meet those people and build a relationship with them, including by cold-calling. Attempt to convince them to interview for roles the recruiter is working to fill. Firms can be paid in advance to complete the work, as well as via a commission – typically 15-30% of the first yearly salary – for successfully placing candidates. Staff then receive a cut of this commission. Of course some firms try to fill senior vacancies through in-house recruitment. This work has some similarities, but is not what we will focus on here. Research Associates support Associates and Consultants with information essential to the completion of the research phase of an executive search. This includes talking to sources and potential candidates, generating names and developing industry knowledge. Researchers provide a bank of valuable potential candidates ready for further contact. A typical time at this level is 1-3 years. Associates do many of the same tasks as researcher associates, but take a more active role in relationship management with clients and with screening potential applicants against the client’s hiring guidelines. If you have past relevant experience you can potentially enter at this level. A typical time at this level is 5 years. Consultants perform full management of the search process including taking the requirements of the client, market analysis, interviewing, assessment and presentation of candidates, help with negotiation, and successful recruitment of the favored candidate. Part of this role involves active business development with clients. Partners/other management manage consultants and leverage their experience and relationships to generate new business. Some executive search staff decide to go it alone and start their own smaller firm base on the connections they have. This allows them to claim a larger share of the commissions if they are successful. What are the pros of this job? The earnings are slightly hard to establish because groups like the Bureau of Labour Statistics do not list it separately. We are concerned that websites which collect self-reports are non-representative. Nonetheless, the following figures should roughly indicate earnings in the industry. * At Korn/Ferry, research associates make ~$50,000, associates/senior associates make ~$100,000, more senior people seem to make in the $200,000 range. * At SpencerStuart Research Assistants make ~$50,000, associates make around $90,000 and more senior people aren’t listed. * At Heidrick Struggles, Associates made around $100,000. Because payment is partly on commission and bonuses, someone who performs well is likely to be paid more than their colleagues. If you think you would excel in the industry, you could look at the top partners who can earn over a million a year through commissions, such as Anna Mann and Gerry Roche. We could not find a survey of the satisfaction of executive recruiters specifically, because they are usually bundled into a much larger category such as human resources workers, which we don’t think will be representative. Executive search will perform well on some criteria for a satisfying job, such as work-life balance and a clear sense of task completion when someone is placed in a job. You are likely to have a middle level of autonomy and variety of tasks. If you are able to make placements and bill clients yourself, you can be given a lot of freedom to manage your own time. The beneficiaries of your work are also clear, which provides some meaningfulness from helping them. However because of the nature of the benefits, and the high income of the beneficiaries, it is unlikely to have the same deep meaningfulness reported in, for example, teaching or medicine. Depending on someone’s particular strengths, the social interaction could be rewarding, the work could be suitably challenging, and the payment for results motivating. While demanding of particular strengths, such as social and verbal skills, executive search is substantially easier to enter than most professional services, such as finance, consulting or marketing. People we have interviewed suggested this was in part because of its lower prestige and lack of any professional licensing arrangements. However, successfully building a network and persuading people to take roles requires you to be similar to the people you are trying to recruit, which for professional services means at least an undergraduate level of education at a good university. We expect a very talented person could progress quite rapidly in this industry. Executive search builds some transferable skills, such as sales/persuasion, general management, desktop research, negotiation, potentially management, social skills, writing and professionalism. However, we expect that the skill building is lower and less transferable than in, say, professional services firms themselves, software engineering or corporate management. In terms of credentialing, executive search is less prestigious than direct professional services, but better than most fully non-professional options. Perhaps in part for these reasons, the most common exit opportunities are into sales, human resources or recruitment within firms. You build up a network, but unless you plan to transition into the industry or service you are recruiting for, it’s unlikely to be very useful in advancing your career. For these reasons, we worry that someone entering executive search early in their career may unnecessarily limit their future options. If you are young, and not confident that you want to work in executive search long-term you should prefer an option that provides more exploration value, skill building and keeps your options open. The direct impact of executive search will be almost entirely dependant on the impact of the firms you are recruiting for. 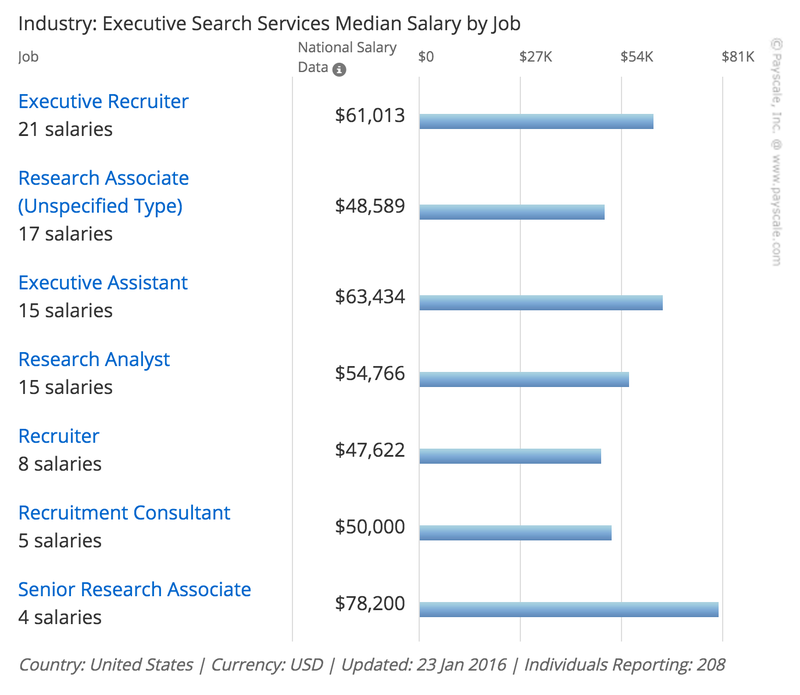 Executive search firms most often recruit for professional services firms. We regard most professional services firms as having a weak positive effect on the world. You could aim to have more impact later in your career by doing executive search for organisations you regard as doing especially valuable work, whether in the for-profit, non-profit or government sectors. Some firms do pro bono recruitment for non-profits such as Saxton Bampfylde. Another issue raised in our interview was the risk of participating in ‘zero-sum competition’ for talented staff between firms, which would prevent you from increasing their total impact. Because executive search (and recruitment and human resources more generally) are not currently attracting the most talented graduates, this suggests there could be more ‘low hanging fruit’ available for improving the productivity of the sector. Someone who was very passionate about the area might be able to rise up the ranks and develop better processes than are currently used. If you did well in executive search you would build a professional network through your work, and could have grateful clients in senior positions. We were initially skeptical about whether in many cases it will be practical to turn these into personal relationships in which you can raise social issues. However, we have heard that at senior levels these relationships can be meaningful and cultivated over many years. This creates the potential to, for example, fundraise for charity among wealthy people, or encourage people into higher impact jobs. We know of at least one case where a senior person in the industry raised a million dollars for a charity they supported from clients. We would be interested to hear more anecdotes to understand how strong these opportunities for influence are. On the other hand this industry offers little public platform for advocating important ideas. Who’s especially suited to it? feel comfortable socialising with highly educated professionals. Someone considering this role should also think about marketing, professional services firms (e.g. Deloitte or KPMG) or corporate management.